Jesus, Churchianity, and Me | Called Out: Now What? Hello everyone. My name is Evelyn and I’m a disciple of Jesus Christ. Like many Americans, I was raised in and out of church. And while I was a young girl, I became very active in church. I attended Sunday school, Wednesday night Bible study, youth retreats, vacation Bible school, revivals, pastor anniversaries, sang in the choir (and also served as the chaplain of the choir), worked in the nursery, food closets, clothes give aways, and the list goes on. But in all of my “church work,” there was a serious problem – I wasn’t born-again. Although I considered myself to be a Christian, in reality I was just an unsaved church girl. I knew some things about Jesus and the Bible, but I didn’t know or walk with the Lord personally, and my heart was not converted. Since I wasn’t born-again and rooted in Jesus Christ, when I left home to attend college I got wrapped up in the occult and the New Age Movement. In fact, many professing Christians today practice some aspect of the occult and New Age Movement. For example, astrology/horoscopes, palm-reading, tarot cards, the paranormal, ghosts, seances and spirit-channeling (i.e., communicating with “the dead”), numerology, a belief in reincarnation, radical extremist environmentalism (which is a form of earth worship), believing that one is a god/goddess of one’s own destiny, believing that “all religions are a way to God/heaven,” etc. The occult and the New Age movement are nothing more than demonic science-fiction fantasy. It’s simply one of the many warm and fuzzy false religions that Satan is using to keep men deceived, separated from Jesus Christ, and thereby enslaved to sin and on their way to destruction. Around the age of 22 I became very sick, yet God graciously used this valley of my life to humble me and draw me to Himself. It was at this time that I began reading the Bible and praying in the name of Jesus Christ, not just for physical healing, but more importantly for spiritual healing. Through my sickness and destitute state, God showed me that I was a sinner whose life was but a vapor. . . and that He was God, and I’m not. It was like God engineered my repentance by allowing my broken self-centered life to come crashing against the reality of HIM, and then in His grace, mercy, love, and kindness – He filled me with His Spirit, made me whole, and gave me Eternal Life through Christ Jesus. Old things passed away, and I became a new creation. Even though my circumstances were far from perfect and my health was still poor, God strengthened me within and gave me joy and peace that passes all understanding. I didn’t know much according to worldly standards, but I knew JESUS. I knew His grace. I knew His love. I knew the spiritual freedom that comes from Him. I knew the spiritual rest that comes from taking His yoke upon me and learning of Him. I knew the simplicity of following Jesus Christ, which boils down to faith and love. I had not yet joined a church-institution, which allowed the Lord and I to fellowship free from distractions and diversions. Looking back in retrospect, I believe that God used this time of 1-on-1 fellowship to build me up in His Word and teach me how to personally walk with Him, because in His foreknowledge, He saw the obstacles and snares that laid ahead of me in churchianity. Like every new Believer in Christ, I was full of joy because I knew for myself that Jesus is real, and I was beyond grateful that He saved me from my sins. And I wanted to express this joy with other Believers, so that we could share in our common salvation together. So in my time of fellowship with God, I prayed for fellowship with other Christians. And this is where things became interesting. . . . I eventually ran into a “pastor” who invited me to his Charismatic Pentecostal cult “church.” It was a small assembly, and many of the people there were very kind. But there were more than a few serious problems. One of them being that the “pastor” fashioned himself as a modern “Moses” or “Joshua,” and told us to trust in his leadership, so that he could lead us into our “promised land.” He often spoke of our “promised land” as a big ‘ministry’ of our own, and said that God had not released us into these ministries yet because we weren’t fully trusting “the man of God” and supporting his “vision” for the cult “church.” He ‘preached’ these sermons under the guise of “faith” – yet he wasn’t speaking of TRUE faith, which is to be placed in Jesus Christ. He was speaking of placing faith in church-leadership, as if they were our personal jesus. The leaders imitated and promoted false prophets from the prosperity movement such as TD Jakes, Juanita Bynum, Noel Jones, Paula White, and Joyce Meyers. They would sometimes bring dvd’s of their sermons to Bible study or prayer service, so that we could watch them. The “pastors” assistant (a woman who I will simply call “Sharon” for the sake of anonymity) gave me an unbiblical book by Juanita Bynum called “My Spiritual Inheritance.” This book promotes the antichrist concept of submitting to a church-leader for “spiritual fathering” “spiritual mothering” and “spiritual covering.” It implies that by submitting to church-leaders (in a top-down cult-like fashion) we receive our spiritual inheritance from God. Yet the Scriptures plainly state that we receive our spiritual inheritance by faith in JESUS CHRIST and His redemptive work on the cross. Members were either praised or looked down on based on their frequency of “church-attendance.” If you attended every meeting throughout the week, you were spoken highly of as “faithful in God’s house,” “obedient,” and “on fire for God.” But if you didn’t attend meetings often, you were viewed as worldly, compromised, lukewarm, backslidden, and disobedient. When members who attended meetings frequently received blessings (such as a new job, a new place, money, etc) they would be paraded before the congregation, and their blessings were pointed at as “a reward for being faithful in God’s house.” And whenever someone who didn’t attend meetings often experienced hardship (such as physical illness, financial hardship, marriage issues, etc) the “pastor” would make indirect statements about their hardships, saying that it was evidence of “God’s judgment” upon them for being “unfaithful in God’s house.” I refer to all of this nonsense as church-attendance legalism. Hebrews 10:25 (“forsake not the assembling of yourselves”) is often used out of context to support this teaching and turn people into church addicts. It is a form of works-based righteousness (that your righteousness is based on how often you attend church-services), and in some cases works-based salvation (that your salvation is based upon how often you attend church services). It leads Christians to burn out and neglect their own families and outside responsibilities, just so they can be seen and known as “faithful in God’s house” by attending meetings all week. Since the leaders were heavily influenced by false prophets from the prosperity movement, it’s no wonder that they promoted the unbiblical tradition of “tithing.” Every now and then, the “pastor” would harp on this tradition, which was really unnecessary because most of us were already cheerful givers. But I guess our cheerful giving wasn’t good enough, because he sat with a widow in his office and showed her the church’s bills, in an attempt to leech more money out of her. The “pastor” also tried to convince another widow to rent out a room in her house, over-charge the person, and give the profit to him. He tried to prey on these widows under the guise of “providing for the house of God.” But praise be to God, they saw right through his tactics. This unbiblical teaching led them to label and slander various members as “witches.” While I was there, 2 women who spoke at a Bible study were referred to as “witches.” And why? Because they prayed for someone near the bathroom at the back of the church-building. Even though they weren’t disruptive, leadership viewed this as “rebellion” because it was not a part of their liturgy or church program. Another lady (the children’s Sunday school teacher) was called a witch, because while the adults prayed at the altar before meetings, she would supervise their children in the back (makes sense right?). Yet since the leaders were controlling, they wanted her to stop watching the children and pray with everyone else at the altar. This sister ended up leaving, as well as a few of her friends who were offended by the actions of leadership. Eventually, I too was called a “witch” for saying that leadership neglected teaching on grace and mercy, and spent too much time “rebuking” from the pulpit – and many times their “rebukes” weren’t even true, they were based on hearsay, gossip, rumors, evil suspicions, speculation, and imagination. They would use the pulpit to maliciously vent about personal issues with congregants, or make indirect innuendos about people they had a problem with. And who could defend themselves when leadership did this? No one. Because the leaders controlled the pulpit and used this advantage to assassinate the character of the saints. I loved the “pastor” and his assistant Sharon, but I could not ignore this problem and brush it under the rug. So I spoke about their lack of grace, mercy, and love. And lo and behold, they held a secret meeting with other church members while I was at work, and told everyone that I was operating in “witchcraft.” No one spoke to me about this meeting face to face (except 2 widows). 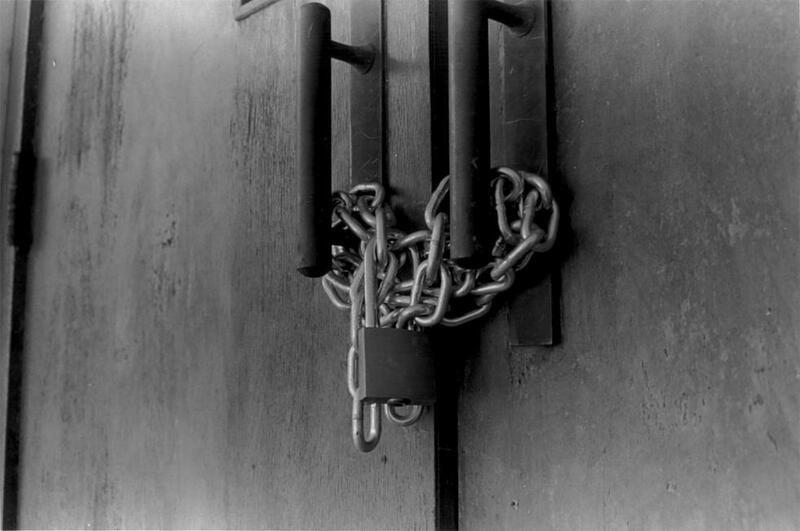 Then when I showed up for a women’s meeting the doors were chained up and locked. Sharon came to the door and told me that the “pastor” said I wasn’t welcome there anymore. This rejection confirmed what God had previously warned me about, that I would soon be kicked out. He told me this one day during prayer, but I didn’t understand how this could be, since I fellowshiped with “Christians.” Do “Christians” kick other Christians out of their churches? I was young in the Lord, so I didn’t grasp this at the time. But when I got kicked out, it was like the Lord’s warning had built up a shield or a hedge around my heart, to protect me from breaking down and my faith from being shipwrecked. No glory to myself, and all glory to God – He kept me. Then He led me to the book of Matthew where He told the disciples that they would be kicked out of synagogues. Then He brought me to chapter 5 which says blessed are the persecuted. I was gradually shown all throughout Scripture that persecution against God’s servants comes primarily from within the religious system, and I was merely walking in the footsteps of Jesus Christ. Many others were persecuted before me (Hebrews 11), and I was simply partaking in the sufferings of Christ. This comforted me, increased my faith in God, and gave me confidence that I was doing the right thing before God. Dare I say it? And not out of conceit, but I outgrew “church.” It actually became a hindrance and a stumbling-block in my walk with Jesus Christ. And no, I’m not referring to the church-building. The church-building was never the issue. But its the mindset, attitude, and behaviors that are often promoted, condoned, and cultivated in many church-buildings today. Sadly, in many cases today, churches are collecting and warehousing church folk, rather than making disciples of Jesus Christ. Although many would call it the “house of God” I call it a Pharisee machine, because it pumps out droves of people who think, speak, and behave like Pharisees, religious enemies of Jesus Christ who come against God, the Gospel, and the true body of Believers. And this isn’t an isolated issue, it’s global and deeply ingrained within the system. All in the “name of Jesus” through Scripture-twisting and churchanese language, a grand deception has been set up. . . . an antichrist religion that calls itself Christianity, yet subtly indoctrinates people AGAINST Jesus Christ, by bewitching them with false gospels, false teachings, and false prophets. No wonder Jesus said that on the Day of Judgment many shall call Him “Lord” and point to their religious deeds as evidence that they knew Him, only to discover that He never knew them, because they weren’t born-again and following Him. They were just ‘churched’. . . with form of godliness, but denying the power of God, which could make them truly godly within. Romans 12:2 says do not be conformed to or shaped by the pattern of this world, but be transformed by the renewing of your mind. Yet many churches today are conformed to the world, because the people within them aren’t born-again and personally following Jesus Christ. So what happens to saints who have a desire to pursue Christ, and somehow end up in the kingdom of churchianity? We find ourselves grieved and in conflict with church crowd. So rather than stay in churchianity, and try to reform a religious-system that is evil at the root, I obeyed God’s call to “come out from among them and be separate. Touch not the unclean thing.” (2 Corinthians 6:17). And I’m not the only one who heard what the Spirit of the Lord is saying about today’s antichrist man-made church-system, to “come out of Her My people.” There is a mass exodus of born-again Christians leaving churchianity behind to follow Christ in a greater way, and if you’re one of them, you might enjoy this blog. But if you’re a part of the false church and you see nothing wrong with “church as usual,” you may not like much of what I write about. I can relate a lot to this blog. Thanks. Wow! I read three quarters of this without knowing who the author was and all of a sudden I got a revelation! This is Evelyn. Sister ! I have watched you on YouTube and reads many of your blogs and now I fell I know you! I can relate to u 100 Percent! It’s a powerful testimony for sure ! hi, amen, Yes this is Evelyn’s testimony and the link to her site is posted at the end of the article. Found your site last nite. I’m always looking to connect with others that have been “called out.” I live in NC. Was called out 3 years ago, really sooner, but I just wouldn’t let go of trying to connec connect wth a church time and time again. I was miserable and just didn’t fit in. I am so free in Christ now and many don’t understand me. God called me out and after I listened to Him, I came out. Now I enjoy helping those He puts in my path. Jesus is my “covering.” Love to you and thanks for this site.